Libraries have always been home to me. The fact that a giant building filled with stories, fictional and otherwise, is there, ready to be taken home at zero cost, has always struck me as something downright beautiful. Because libraries are also comfortable and warm places, they can also bring folks who have nowhere else to go. I've been using Bend's Deschutes County Library for more than 15 years and while there have always been the displaced, mentally ill, destitute, and folks falling on hard times, that population has only grown over the years. It is rare when at least one chair isn't taken up by someone just looking for a place to close their eyes. What Sarah Kelley (a master's in social work candidate at Portland State University) is doing at the library is nothing short of priceless. She helps people on such a fundamental level that just about anyone she meets will have their lives changed for the better by the end of the conversation. Here is a short interview with Kelley, where she explains exactly what it is she does in her own words. Source Weekly: In a nutshell, what it is that you do? Sarah Kelley: So, I started this library program. 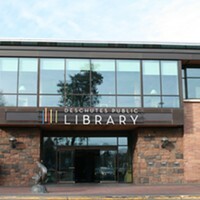 The program is in partnership with the Deschutes Public Library and the United Way. The idea is to put access and connection to resources where people who could utilize that support already are. My background is in doing community outreach work and helping people that are living in poverty connect to the resources they need to get out of poverty. To find better housing, to get onto health insurance, and to find resources in their community that would be helpful to them. In that work I found lots of people who used library spaces. Libraries provide a space that is open to the public, that is warm and well lit and comfortable and safe, and folks can hang out there all day long. 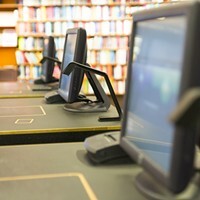 So, a lot of folks without some support in their life, that are underemployed or lacking housing, come to the library because it's a place they can hang out and have free wi-fi and get on computers and be comfortable for awhile. Putting these kinds of resources there makes sense because there are so many people who can utilize it because they're just naturally there and it's a really natural connection. SW: And you've been doing this for over a year now, right? SK: Yeah, I have. Officially I've been doing it over a year. The first year was a lot of program development and figuring out what the need was in the library, what resources they were after, and if it could fit in the library. And they were able to say, "Yeah, there's a huge need here." I saw lots of people. I'm making about 500 contacts a year. That could look like meeting for 10 minutes to provide a housing application or that could be meeting for an hour and getting online to apply for social security benefits. Through that time they were able to establish, "Yes we have the need, yes we have the people." The library, in the partnership, they provide the meeting space, so they give me office support and computer support, so there's no overhead and it's a really affordable program because I can just go into a space that already exists with people that are already there and just take my knowledge of community resources and connect those people to those resources. SW: How often are you at the library? SK: As of October it's the first time we've been funded. So, the funding is pretty small right now, so due to the funding I'm in the Downtown Bend library twice a week, Mondays and Wednesdays from 10 to noon, and then I'm in the Redmond library twice a month from 1 to 3 pm on Mondays. The vision is to get me into all six libraries on a schedule that looks more like 20 to 30 hours a week. SW: What would you recommend for people to do to help you in your mission? SK: I would say financial is our biggest need right now. 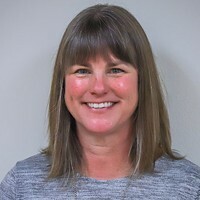 That partnership with the United Way provides the budget, so any donations can go straight to the United Way of Deschutes County and be identified to go towards the social work in the library program. The more money we can get then I can expand my hours and that means I can add in the Sisters library and La Pine and Sunriver. It's pretty significant. Also, I'm always in need of bus passes and gas vouchers so people who aren't at the library can actually come and see me.